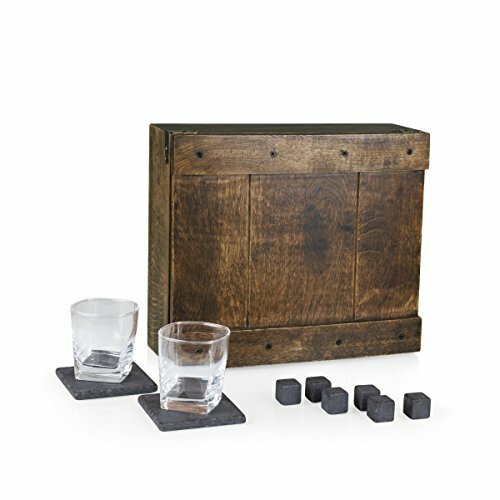 The Whiskey Gift Set by LEGACY - a Picnic Time brand is a dark and handsome solid oak chest with rustic nails and secure storage for your favorite 750 ml whiskey bottle, along with the coordinating bar pieces that are included: two 8-ounce lowball/DOF glasses with weighted shams, two soapstone coasters, and six soapstone whiskey cubes to chill your drink without diluting it. Modern, yet vintage, this whiskey set will be the artifact your grandkids remember standing stately and unassuming in your man cave. Measures 14 by 12 by 5 inches and backed by the Picnic Time Family of Brands BUILT TO LAST Lifetime Guarantee. Two old fashioned whiskey glasses, two coasters and six ice cube stones included; Add a nice whiskey and present this as a gift! If you have any questions about this product by LEGACY - a Picnic Time Brand, contact us by completing and submitting the form below. If you are looking for a specif part number, please include it with your message.